Meanwhile, Shulkin told Politico Tuesday that it was conservative foes and not he who would be fired. He also claimed that the White House supports him. President Donald Trump gained bipartisan bona fides by choosing an Obama holdover for Secretary of Veterans Affairs. Every Democratic senator voted for his confirmation. 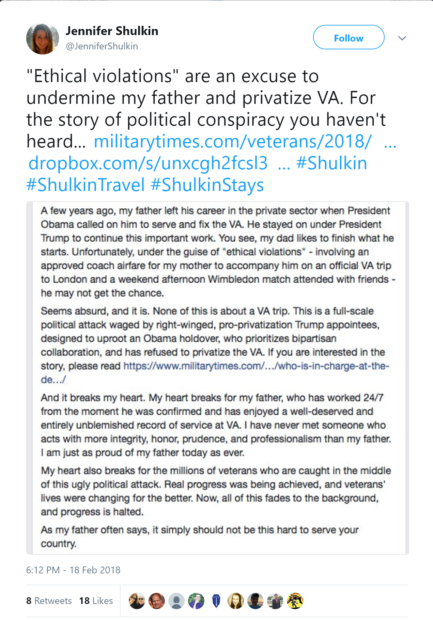 But conservatives like Darin Selnick, veteran affairs adviser for the White House Domestic Policy Council, and Jake Leinenkugel, a Trump official embedded in the VA, have struggled against Shulkin to implement policies favored by conservatives at the agency. Leinenkugel noted that Shulkin’s right hand woman, chief of staff Vivieca Wright Simpson, proudly said she was a Democrat. Simpson resigned Friday after the inspector general found that she had falsified an email to wrongly obtain approval for pay for a trip to Europe for Shulkin’s wife. Shulkin publicly supported his former chief of staff after the inspector general report detailing the falsified email. “I want the very best thing for her… this is a very, very tough time, when your integrity is challenged, when your ethics are challenged,” Shulkin told The Daily Caller News Foundation on Friday. Shulkin would not say if he thought Simpson had written the incriminating email. He instead told Congress that it could have been a hacker — even though it came in the middle of a back-and-forth that started with a verbal discussion. He described to TheDCNF the single incident he says supports his claim on the very day the IG released the report on the incriminating email. The White House also forced Shulkin to delete a statement saying he had “done nothing wrong.” TheDCNF asked the secretary what if anything he did anything wrong. “I regret that there is this distraction,” he said.